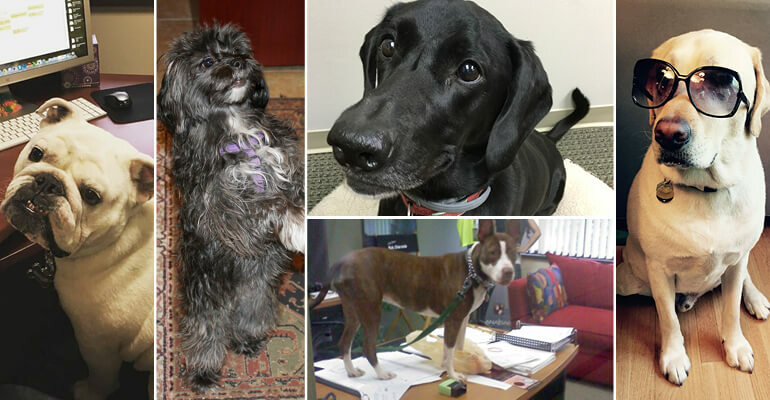 If you follow Austin & Williams on social media or browse our talent gallery, you’ll notice we’re a pro-pooch office. Throughout the years of having our four-legged friends roaming our halls, we’ve found they not only bring a smile to our faces, but also draw us out of our offices and help us engage in fun, spontaneous chatter that makes us a more creative agency. When I came to A&W a year and a half ago, the chance to bring my English bulldog, Chester (far left), to the office told me a lot about the people I’d be working with. Getting to know my coworkers’ dogs has helped me get to know them and fostered a stronger sense of camaraderie. And the dogs love it—because they know who has a stash of treats in their desk drawers! Our commitment to our dogs is more than just having them wander the halls looking for belly rubs. A&W President Eva LaMere is a member of the board of directors at Canine Companions for Independence (CCI), which raises and trains assistance dogs for people with disabilities. We also work closely with Pet Peeves, a nonprofit that raises funds and awareness for Long Island’s struggling animal shelters and rescue groups. Our pups also provide some comic relief—like Suki, a 65-pound pit bull rescue (middle, bottom). Our dogs also have a special impact on the people in the office who don’t have a pet at home, like Juan Tejada, Paid Search Strategist. Do you—or your business—share our love of dogs? We’d like to know!